Gorilla Tracking Permits are issued by the respective Government Agencies in the name of the traveler. We will purchase the Permits for you on your behalf, as a complimentary service to our clients, but the transaction is governed by the rules and conditions of each country's Agency. Please read the Government terms and conditions carefully - in most cases and under most circumstances, Permit fees are not refundable.  Susa - the largest group with 41 gorillas. This family is the hardest to trek as it tends to range high into the mountains but RDB Tourism & Conservation trackers will know well in advance where the group is located. The group is also well-known for having rare 5 year old twins named Byishimo and Impano.  Sabyinyo - Sabyinyo is an easily accessible group led by the powerful silverback Guhonda. There are fewer members within this family than in the other groups however they are equally impressive as a family.  Amahoro - led by the calm and easy going Ubumwe, Amahoro is made up of 17 members and means "peaceful". 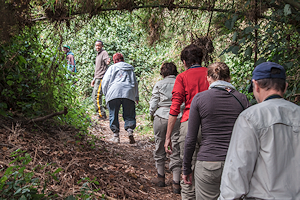 To reach Amahoro one must endure a fairly steep climb however the climb is well worth it once in contact with this tranquil group.  Group 13 - when first habituated this group had only 13 members hence its name. Now the group has approximately 25 members, a very positive sign for conservation and the efforts put forward by RDB Tourism & Conservation to protect the gorillas' habitat. 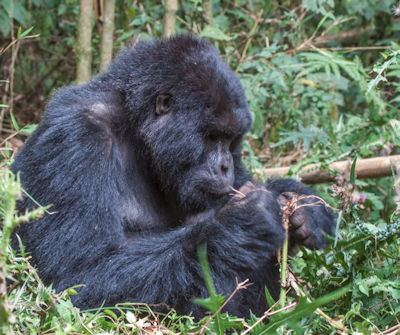  Kwitonda - this 18-member group is led by Kwitonda which means "humble one" and has two silverbacks and one blackback. Having migrated from DRC, this group tends to range far making it a moderately difficult trek.  Umubano - a family of 11, Umubano were originally Amahoro members but broke off after the dominant silverback was challenged by Charles, now the leader of Umubano. When a young silverback challenges the dominant silverback he must steal some females from the existing group in order to form his own family; thus Umubano was formed. 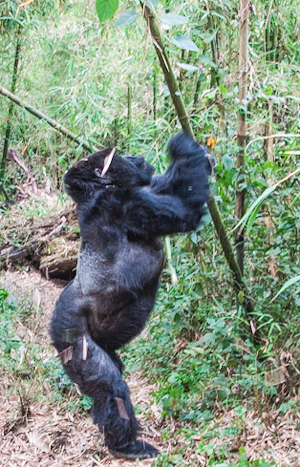 There are 4 habituated groups of Mountain Gorillas in Bwindi National Park - HABINYANJA, MUBARE and RUSHEGURA are in the Buhoma side of the forest, and NKURINGO is in the southern area. Only 8 daily Tracking Permits to each Group are made available by the Uganda government - a total of 32, and that's all. In the adjacent Mgahinga National Park, there is another group for which an additional 6 daily Permits are available. A small number of the permits in Bwindi are sold 24 months in advance, and the balance are sold three months prior to trekking. 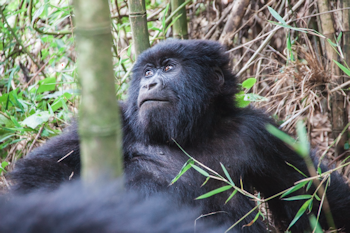 At Mugahinga, permits are on sale three months prior to trekking date - this is due to the fact that the gorilla family at Mgahinga sometimes crosses the boarder into the Congo. It's advisable that you confirm your dates with us as early as possible; however we can always try to secure permits on short notice with a full deposit - and Rwanda is always an alternative in such cases. The DRC also has a section of the Virunga Mountains park called the Parc National des Virunga. However, the situation in the DRC is too unstable for anyone to really view the mountain gorillas at this time. This BBC news report shows the situation is quite dire for both people and animals and doesn't appear to be improving. cool climate high in the mountains. In Rwanda the cost of the Permit is USD $1,500.00 and in Uganda USD $600.00, per day per person. We do not add a surcharge to the cost of the Permit - the cost to you is what we pay the respective Government for your Permits. Please remember that the Permits are not refundable. In an emergency we can try to resell the Permits for you, but there is no guarantee that we will be abl to do so.